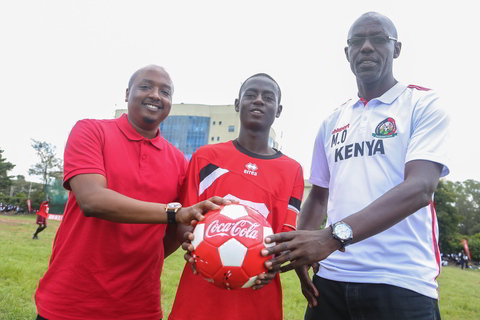 Rodney Nzioka, Senior Franchise Brand Manager (Left), Victor Osimbo student at Olympic High School (middle) and Musa Otieno, former Harambee stars Assistant Coach (right) holds a ball to officially launch the 2018 COPA Coca-Cola Tournament. COPA Coca-Cola is celebrating 10 years of nurturing football talent. It is now a decade ever since Copa Coca-Cola Under-16 tourney began nurturing youthful football talent across the country. Inaugurated in 2008, tens of thousands of students have gone through the talent identification and nurture process that has seen many of them graduate and get the much-needed extra-curricular activities in the secondary schools' system. This year is the tenth anniversary and it has come as good news to note that it has coincided with the launch of this year's tournament. As the talent nurture continues in secondary schools, it has been noted that it is important to renew the partnership with the Kenya Secondary Schools Sports Association (KSSSA) for the sake of posterity and prosperity in young people's footballing talents in the country. He also added that a total of 5,000 boy and girl schools are expected to participate in this year's tournament, a feat that will increase the figures by 25% from last year with the total number of games to be played throughout the tournament increasing to 3,670 games. He also said that notable talent has been realized and propelled through the tourney. “The competitive and professionally managed games conducted in partnership with KSSSA, have been the beginning of successful careers for notable players such as Peter Odhiambo (Gor Mahia FC), Daniel Mwaura (Mathare United FC), Robinson Kamura (AFC Leopards) and Harun Nyakha (Wazito FC),” said Rodney. Rodney, reiterated the importance of consistency when scouting for talent throughout the country through experienced coaches. He promised that there will be a team of experienced coaches who will select exemplary talent among the students to join other top talents across the world to learn from elite stars in the trade. The regional tournaments, which only admit students under the age of 16, will set the stage for the national championship that will be held in Eldoret from July 20 to July 29, 2018. the defending Champions Kakamega High School from Western and Olympic Girls High School from Nairobi will be looking to retain they hard fought titles in the boys and girls categories respectively. Through the years, the company has been taking gifted players for specialized training at the COPA Coca-Cola Global Camp. The inaugural trip was a tour in Rio de Janeiro in Brazil with subsequent tours being in Johannesburg and Durban in South Africa, London-United Kingdom, and Paris-France. The Kenya National Team, Harambee Stars, have benefitted from past tournament graduates who have performed exceptionally well for the national team. They include Victor Wanyama, Dennis Oliech, Michael Olunga, and others who are already on the top scene or are on their way to the top.